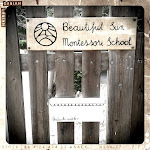 Beautiful Sun Montessori: Color Theory. These past weeks I've been dabbling with some lessons in science/art about color theory. My original motivation was to try this because I want to do more in depth work with water colors and pastels, and in order to do it, I'd like the children to make their own colors. I printed out a great image of a color wheel from an art website (here). This site has a great simple explanation of the color wheel. At first we looked at it only from a geometric perspective. We took out the large hexagon box from the constructive triangles as well, and recreated the shape inside the color wheel. Then I introduced the language of primary and secondary colors. I did some 3 period lessons with some of the children with the color tablets box II to introduce them to the primary and secondary colors. I took out the color tablets from color box III that are needed to recreate a color wheel and put them in a basket on the shelf, and put it on the shelf as an extension of the color boxes for a week. We also reinforced the comparative language for "dark" and "light". Then with a set of small glasses and water, we created a color wheel with food coloring. This was the introduction to color mixing. We noticed that depending on how much of one color you put as a base would determine the shade of the color when you mixed it. It was amazing how much the children were wowed by the changing colors, it is nothing short of magic. And finally, on our science table, I made a color mixing work available. We put 3 glasses on the table, each full of water in one primary color. With an eye dropper, the children can mix colors in a small ice cube tray. Needless to say, it has been the most popular job of the week. Love all of it. Already showed the color wheel site to my 7 year old. What a great link! They also had a prism explanation and my daughter reminded me that one of the Magic School Bus episodes has the children travelling thru a prism. This link is for the book. Lovely ideas! That site is so helpful. I can't wait to create more color work! great ideas! Love the color wheel and isolating the colors to make the wheel in a basket. I've done several color mixing activities, but I love the wheel ideas!